During CES, Montreal-based Bluewave privately showed the first Bluetooth aptX HD wireless headphone amplifier. The high-powered, high-fidelity, 24-bit portable solution allows any standard headset to receive near wired quality of the new aptX HD methodology. It also features an onboard MEMS microphone to add telephone conversations to a favorite production headset with the added boost of Bluetooth portability. The GET is a high-performance Bluetooth-enabled audio receiver that measures 57 x 32 x 12mm and weighs less than 30g. As shown in the images, the Bluetooth receiver sports a compact and sleek appearance design, and its metallic accents add much gorgeous modern aesthetics to the compact Bluetooth adapter. Meanwhile, a rotatable clip allows you to easily attach the GET to your cloth or backpack, and using custom clip, you can easily mount it on your on-ear headphones. 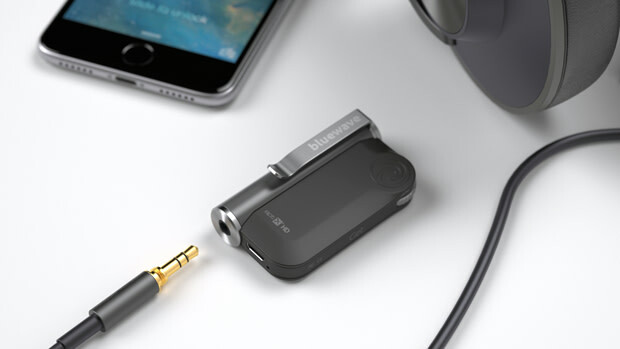 Using built-in Bluetooth technology and 3.5mm audio jack, the audio receiver effortlessly turns wired headphones or speakers into wireless headphones or wireless speakers. Furthermore, its unique amplification circuit without any capacitor is designed to reduce noise and harmonic distortion and achieve high-quality wireless stereo audio. Moreover, the audio receiver comes equipped with Qualcomm/CSR’s CSR8675 with integrated DAC that receives digital signal and outputs analog audio signal, and it supports 24-bit aptX HD audio and Enhanced Data Rate (EDR). In addition, its 200mAh rechargeable battery offers up to 6 hours of continuous playback between charges, and integrated control buttons and wheel let you easily control your music playback. A built-in microphone is designed for handsfree calls. The GET has been available for preorder on Indiegogo. You can pledge $79 to preorder the Bluetooth HiFi headphone amplifier. It will be shipped in April 2017 (estimated).